A huge, brutish member of the Luxan -- a race of fierce, much-feared warriors known throughout the galaxy for their propensity to conquer anything or anybody in their path -- General Ka D'Argo's first reaction to almost every situation is to go in blasting and ask questions...never. In season one, it is revealed that D'Argo was framed for his Sebacean wife's (Lo'Lann) murder. 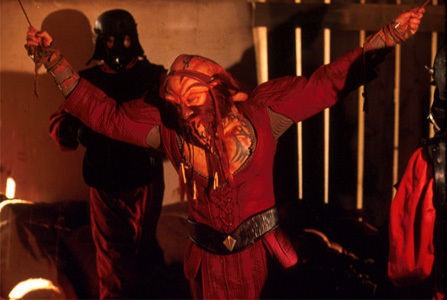 Although Captain Crais was aware of his innocence, the Luxan warrior was imprisoned by the Peacekeepers, in no small part due to the Peacekeeper feeling that a Sebacean/Luxan pairing was miscegenation, and an abomination. His hatred for the Peacekeepers runs deeper than most, and he lives to reunite with his son, and to avenge the wrongs that have been done him and his family. 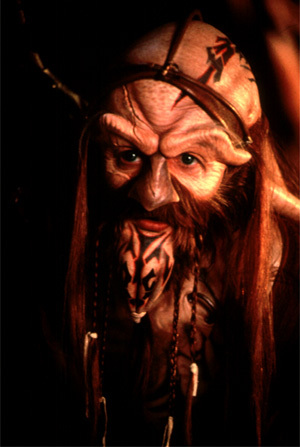 D'Argo has a harder time than most connecting with others aboard Moya, although lately he's grown to respect Aeryn as a fellow warrior and Crichton as a fighter and almost a friend. He also has much respect for Zhaan and may have developed some protective feelings toward Chiana. Any kind of good relationship with Rygel is probably a lost cause. Besides the false imprisonment he endured for murder, D'Argo another bit of false pretenses in his past. In order to save his comrades in battle, he assumed the rank and guise of a Luxan general. This act saved his compatriots, but the deception troubles him still for, according to the Luxan code, it was a dishonorable act. His experience aboard Moya, and the love and friendship he's seen develop among Moya's crew has taught him patience and understanding... to some degree. His relationship with Zhaan, in particular, has taught him that there is much that's mightier than the sword (or Qualta Blade, his Luxan weapon of choice, half sword, half energy rifle). D'Argo admires Zhaan for this more than he'd ever admit out loud... fortunately, Zhaan can often sense what goes unsaid.